Visitors to Ubud might enjoy visiting one of the most famous landmarks in the area, the elephant cave at Goa Gajah. Located 2kms to the SE, Goa Gajah draws visitors, from overseas as well as other parts of Indonesia, as well as local worshipers. From Ubud head for Bedulu and look out for the obvious ‘tourist object’ indicated by the crowd of people around. 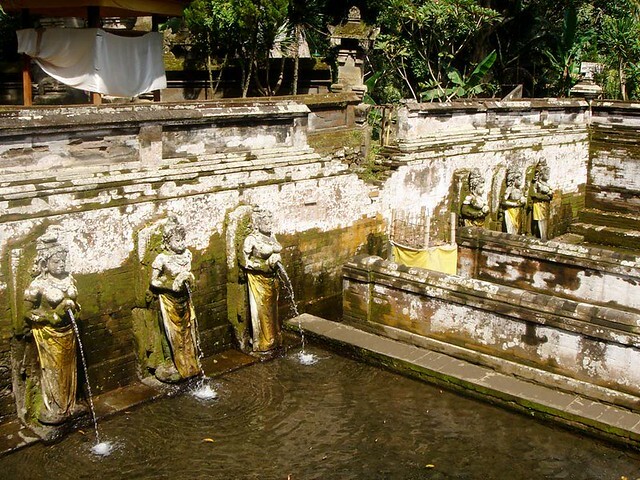 Goa Gajah is named after Sungai Petanu (Elephant River) and dates back to the 11th Century. Originally the temple was a dwelling for Hindu priests. The main highlights of this temple are the short cave with the massive carved face entrance and the holy pools. Visitors will go into the cave, spending several minutes in the darkness checking out the Shiva lingum at the end, before exiting to take holy water. The large gaping mouth at the cave entrance is probably in honor of the Earth god Bhoma, or alternatively the witch Rangda. Wrapped up in symbolism, the scary cave entrance might mean one is being devoured or at least entering another reality. Many people view the temple entrance to be a a carved elephant’s head and apparently there are other animal shapes either side of the entrance. The interior of the short cave is shaped like a T-junction. Inside the darkness takes a moment to get used to, although there in no danger of getting lost. The interior was cut my Balinese priests centuries ago by hand. Balinese legend says the giant Kebo Iwa carved the cave out with his fingernails in only 1 night. The Shiva lingga (Hindu stone phallic symbols representing fertility), of which there are 3, are located at the end of right turn. At the end of the left turn is a Ganesha statue. Shiva (the Destroyer) of course represents death. In many cultures around the world, for example the Amazonian tribes S. America, the shaman, or witch-doctor deals with the realm of death and transcendence. Perhaps the darkness and threatening nature of Goa Gajah was a place for early Balinese priests to delve into another reality temporarily. Outside the cave at the pavilion is a statue of Men Brayut, the Balinese woman who together with her husband Pan could not stop having kids. The legend of Men Brayut is also represented in local Buddhist writings, under the name of Hariti, indicating a possible Buddhist association with Goa Gajah as well as Hindu. Past the bathing pools is a small ravine, the location of other Buddhist relics such a relief of a Buddhist stupa and Buddha images.